Taylor recently took an art camp. I made her pose for a picture one morning and thought "Oh what a cute pose". Not until just a few minutes ago did I realize that a sneaky little sister photobombed her. Still a cute photo of our girl. I added one taken from later that day. She decided to get some of her artwork on her face. Not sure how that happens but it was cute too. I guess Ollie decided that Taylor needed help. She just kept on working while he hung out in the chair behind her. Lizzie cracks me up. This kid is constantly coming up with something new and when she told me that she has a "party jump" to celebrate the swim party I died laughing. Since videos are hard to put in photo books later you get a screen shot from the video. 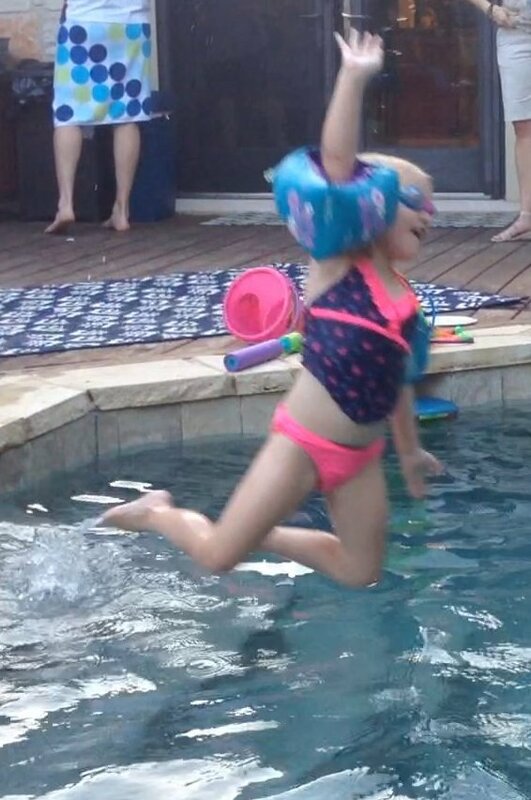 She throws herself into the air from the pool steps and yells "party jump". Do you need entertainment for your next pool party? This girl is a fish already and would spend all summer in the pool if I let her. Get ready for a summer of photos of her in goggles because that is how she looks most of the time. Sorry this isn't one of those "cute" pictures but instead a picture that Taylor took with our waterproof camera. Pretty good for a seven year old. I love seeing what photos they take and their perspective on the world. I'm having a hard time finding Lizzie. Can you find her? This is the face of girl very excited for summer and second grade! Doesn't this look like the fieriest flower girl you've ever seen? Good thing she got all the silly faces out in the bridal suite and was all cuteness during the ceremony, except for when she needed to go potty. The girls were flower girls in my cousin's wedding a few weeks ago. I loved seeing them all dressed up and getting to be a part of her special day. While trying to take a solo picture of Taylor this is what I got. That blur would be Lizzie photo-bombing her. This picture is also a great depiction of their personalities. What you don't get in the picture are Lizzie's giggles the entire time she is attempting to photo-bomb Taylor. Lizzie loves her pretty dresses and boots. From what I've heard it's because she likes to look pretty but the boots are easier for playing, jumping, splashing in puddles, or whatever else she needs to do. Turning seven means discovering a love for science, wondering how the world works, loving the ability to expand your knowledge by opening a book, building confidence with karate, wanting short hair, loving blue jeans and jean shorts(after years of hating them), wearing shoes with laces that you tie, having several best friends, getting irritated when your little sister wants to hang out with you and your friends, wanting to be a teacher and going to Texas Tech like your Aunt KK to become one, loving green apples, needing corn cut off the cob and apples sliced because your front teeth are missing, loving the outdoors, creating all kinds of new inventions in the craft room, hunting with Daddy, imagining with your little sister, still wanting songs at bedtime from Mom, and just being the sweet girl she is. I love seeing you grow up Tay! 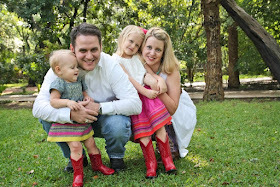 I started this blog a little while before having Taylor, but having kids really defined this blog. This is my digital scrapbook of them as little people and my backup in case something happens to all our files of pictures. For a while I actually did a weekly log of what we were doing and unique things about each kid. Taylor turned seven and reality hit that I don't feel like I've documented her life like I used to. She had me read the shutterfly book I made about her birth and I love pouring over each picture. I loved remembering each moment or trying to recall the parts that are a bit fuzzy since I had just finished having major surgery(a c-section). Sadly I won't forgot getting sick in front of all my family members(in-laws too) as the spinal tap wore off. Reliving those sweet memories made me want to rush onto Shutterfly and make each year that I haven't finished yet or sat down to do. I want to be able to take that visual journey with her anytime she wants and remind her of all the silly, frustrating, embarrassing, and loving things she did as she grew up. Until then I will settle for this collage to remind me of how my girl has grown over the years. There are two pictures from when she was three(middle row, left and middle pictures) but the rest are one from each year around her birthday from birthday until seven. Happy 7th Birthday sweet girl! I try not to be shocked anymore when Lizzie comes down the stairs in random outfits. On this day it was more cuteness than a wow factor. Lizzie hasn't been in dance for over 9 months, has no desire to take dance class, but does find the need to full dress in dance gear every so often and request music videos. I sat back and watched as she rocked her little tutu off to Taylor Swift, Meaghan Trainor, Pitbull, and Ariana Grande. This girl likes her music and dancing makes her happy. I was reminded this week of how much other people enjoy these emails and pictures when the girls 94 year old great grandmother kindly commented that she missed seeing their pictures. I didn't even know my father-in-law was forwarding them on to her. Her comment made me think about how I may see the girls everyday but some of our friends and family don't. Plus I know that years from now I will not remember why Taylor stopped to give me her sweet smile or why Lizzie was doing something adorable. So my loved ones, here is the girl who started it all giving us one of her sweet smiles that I love so much. Happy Taylor Tuesday on Thursday!